Steam Autoclaves Market size was valued over USD 1,733.9 million in 2017 and is expected to witness more than 8.7% CAGR from 2018 to 2024. Increase in demand of steam autoclaves for managing hazardous biomedical waste will drive the business growth during the forecast timeframe. The U.S. central government had passed The Medical Waste Tracking Act in 1988, setting the standards for government regulation of medical wastes and to handle the disposal of medical wastes in the coastal areas of New Jersey, New York, Rhode Island, Connecticut and Puerto Rico, owing to numerous medical and household waste throughout various coastal areas. The rise in need to treat and manage biomedical waste will boost the steam autoclaves market growth in near future. Nosocomial infection or hospital-acquired infection (HAI) has witnessed a gradual increase in the past couple of years. The infection is majorly caused by virus, bacteria or fungal pathogen and slowly becoming the paramount cause of mortality and morbidity across the globe, causing massive economic burden. Increase in prevalence of nosocomial infections in the Europe region will result in growing demand and adoption rate of steam autoclaves, fuelling the business growth in forthcoming years. The availability and development of growing array of disposable items for use in the health professions have accelerated in recent years. One of the recent infection control areas of discussion includes dental burs. Dental burs are a significant tool used for procedures such as tooth contouring, restorative filling procedures and endodontic procedures. From an infection control point of view, the risk of patient–to patient cross–infection can be eliminated, resulting in decline in the use of steam autoclaves, impeding the growth of steam autoclaves market. 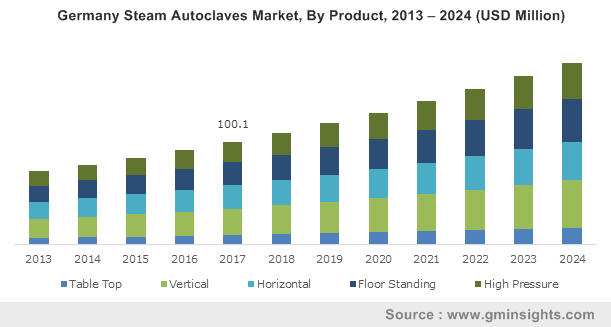 Vertical steam autoclaves market held the largest market share in the year 2017 and valued at around USD 442.6 million. Vertical steam autoclaves provide efficient and safe sterilisation. Increase in use of vertical steam autoclaves in hospitals, clinics, bacteriological and research laboratories, beverage and food units will result in growing demand, thereby augmenting the business growth. Table top steam autoclaves market will witness considerable amount of advancement at a CAGR of 9.4% over the forecast period. The growing demand for portable devices will drive table top steam autoclaves market over the forecast period. In addition, automated devices have led to development of automatic table top steam autoclaves with varied volume sizes, resulting in growing demand and adoption rate of steam autoclaves. Gravity displacement technology market accounted for over USD 752.8 million in 2017. Most of the media that is needed to be sterilised through this technology is simple and does not contain spaces or obstacles for steam to penetrate. Hence, due to the above factor, gravity displacement autoclaves are the most common types of steam autoclaves used in the market and usually the preferred type of autoclave for most applications. Pre-vacuum technology market is estimated to grow substantially at a robust CAGR of 8.9% during the projection period. The pre-vacuum steam sterilisation is very effective in sterilising porous loads or partially vented containers. Increase in demand for pre-vacuum steam autoclave due to its varied advantages in sterilising different objects such as wrapped goods, packs, animal cage bedding, cages, porous materials, redbags, etc., will boost the adoption of steam autoclaves based on pre-vacuum technology. 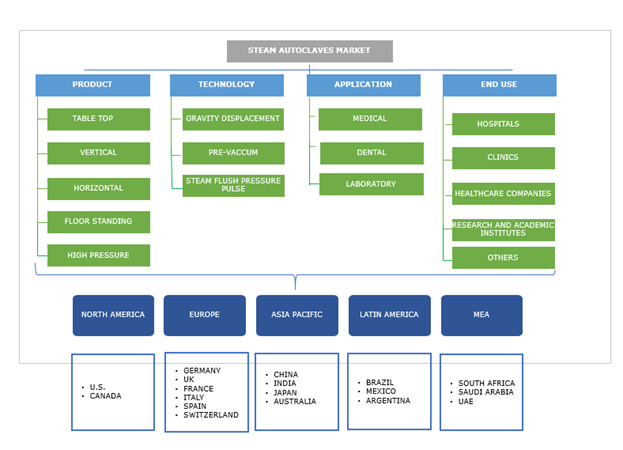 The sales of steam autoclaves for medical purpose accounted for around USD 870.9 million in 2017. The use of steam autoclaves to sterilise and disinfect medical devices/equipment such as implantable medical devices, surgical instruments and surgical linens that are used in complex medical procedures and increase in use of steam autoclaves to treat the medical waste will drive the market growth. The sales of steam autoclaves in laboratories will expand at a CAGR of 9.0% in the forthcoming years. Laboratory steam autoclaves are specifically manufactured to provide high quality performance and accountability for a broad range of applications used in modern laboratories. Increase in number of research and development activities involving harmful elements will result in rising demand for steam autoclaves, boosting the market growth. The use and sales of steam autoclaves in the healthcare companies was high in 2017 and generated over USD 598.9 million. Pharmaceutical and healthcare industries have become more concerned about safety issues and thus steam autoclaves have become a vital component for regulating microbial contamination. Increase in number of biomedical research and pharmaceutical production by companies in the life science industry will lead to enhanced business growth in upcoming years. The sales of steam autoclaves in hospitals is projected to increase at a CAGR of 9.1% during the forecast timeframe. Steam autoclaves are widely used in the hospitals to maintain sterile environment and keep the instruments disinfected. Heightened demand for autoclaves for disinfection and sterilization of medical gowns, equipment, clean room and healthcare supplies in the hospitals will boost the steam autoclaves market growth in hospitals. China steam autoclaves market is estimated to grow at a CAGR of 9.8% in the near future. The rising amount of industrial hazardous as well as medical waste creates pressure for optimal waste management in order to safeguard public health and environment. The growing demand for personalized medicines, increasing healthcare spending by government as well as growth of pharmaceutical industry will drive China steam autoclaves market over the coming years. Some of the leading players in the steam autoclaves market include Getinge Infection Control, Tuttnauer, Priorclave, Matachana and Medisafe International. These companies focus on decisions to increase the research and development investment. Merger and acquisitions have resulted in increasing the operational capabilities of the companies and increased their efficiency to expand in the market by providing better solutions. Also, new product launches in several different geographical regions will enhance the growth of the companies. For instance, in May 2018, Getinge announced the launch of next generation steam autoclaves, GSS Steam Sterilizer series, developed specifically for biomedical research and pharmaceutical production by the companies in the life science industry. Steam autoclaves have been used from many years to sterilise certain equipment in order to prevent sickness. Over the period of time, most technological advancements pertaining to steam autoclave have focused on either the process of sterilization or innovating new types of sterilization cycles. The industry consists of several different types of players but only a few dominate the steam autoclaves market. Strategic agreements and collaborations between key players is one of the most adopted strategies in the market. The growing demand for portable and automatic devices has resulted in development of advanced portable autoclaves. The large capacity autoclaves required in healthcare establishments such as hospitals will stimulate demand for floor standing steam autoclave in the future. The stringent regulatory rules established by U.S. FDA and European commission with respect to medical waste management will further favour industry growth.